Thank you for sharing . And thanks for opportunity to win a set . Don't count me for the drawing (I earned the set!) but I had to say how much I love this card, Natasha! It's so clean and fresh and perfect! Such a pretty card!! I would love to win the set - thanks for the chance! A great card. I love this simple way of making cards. And of course i want to make a change to get this loveley set of stamps. Thanks for this opportunity to get it. I just love this card, in fact I love all your cards. They are easy and beautiful. Thanks for a chance to win the great stamp set. Wow, I'm always impressed by beuty in simplicity. Such nice art. Great stamps too. Awesome card! The repeating circles really draw the eye against the square card and the white against kraft is perfect. Only 10 minutes?? Even better!! Really neat stamp set! I think I missed earning it myself by about one order - thanks for the second chance to have it! This is beautiful! Stunning in it's simplicity. Cool, I'm the first one! I love the simplicity of your card! I'd have a hard time leaving it alone. So pretty! Oh, I just noticed comment moderation is on. I'm probably not the first one. Oh well. The first comment never seems to win so that's good afterall!! :) LOL. Hi Natasha. Love your cards--all of them. Thanks for sharing your work with us and thanks for the chance to win. WOW yes please, I would love to win this set, it looks fabulous. Many thanks for the chance to do so. Your card is gorgeous. I would love to win the set, thank you. Totally love this card and I would love to win the set. It's the first year I didn't earn one. How generous of ou to share this set with someone. Love the card too! Love your card and would love the opportunity to win the set. It has so many possibilities. I have the first anniversary set, but never earned the others so would love to have this one. You do such a fabulous job with the CSS approach. Thanks so much. Oh wow ... please count me in, I would love to win this set ... I love papertrey and I love your clean and simple cards .... this one is no exception ... thank you for your regular dose of inspiration!!! What a simply fabulous card! I love the design, and the colors are great too! Thank you for the opportunity to win such a great set! Your card is fabulous as always - you are an absolute inspiration. Thanks for the chance to win the set. Oh my gosh! How cute is this? So simple and elegant. Just perfect! I'd love to win the set! Thanks for sharing. This is my favorite style and it is so great! What a delightfully CAS card!! I went to the link and took a peek of this set! Oh, my......so pretty. Thanks for the chance to win. I like the colors of your card. Did you use a punch for the little flowers or did you hand-cut them? Lovely card and thanks for sharing this set. I would love to win...I love papertrey things, so bought some papers and ribbons, rhinestone and 3 inks...and by that time I had already overspent...lol. Oh My Goodness! I cannot believe you are giving away a PTI set!!! I don't own any and I love them all!! I would love to be in the draw! I'm having a giveaway next week! Love this card and would really like to have this set. Your blog is the best. Thanks. That set is so CUTE! I may have to become a regular shopper of PTI... Thanks for the chance to win, and for posting your adorable card. Thank you for sharing . And thanks for chance to win a set . Oh I love this set! This is the ultimate clean & simple card. TFS! I love this set and would love a chance to win it!!! It is a beautiful card and I really love your blog - it's one of my favorites! I love this card-neat idea to make it and so quick and easy!! Thanks! What a sweet and simple card. Thank you for the chance to win this set. I just recently found PTI and I would love to add this set to my rapidly growing collection. Thank you so much for giving away this wonderful set..hope I get lucky. This is so cute!!! I'd love to win this set. I so enjoy your layouts & color combos & always look forward to receiving my "updates" from you. this is darling!!! 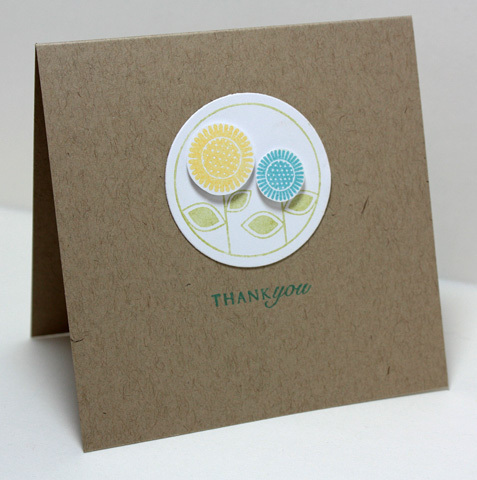 Love the spring flowers and colors with that kraft cardstock!!! Would love a chance to win the set! Your card looks great! TFS :D Thanks for the give-away as well! Lovely card! I would love to have this set! I love this card. It is so elegant. I will be using this card in my sketch book of ideas. Love your blog! I find myself using your sketches time after time. Thanks for the inspiration! Thanks for the opportunity ot win this cute set. Great card. Thanks for a chance to win the set. I love PTI stamps. What a great 10 minute card! Love it! :) Thanks for a chance at your very generous giveaway! Thank you for the opportunity to win this very cute and versatile set! You blog is always an inspiration to me! I was going to leave a comment on the adorable card and to find that there is a stamp giveaway as well is a bonus for me! I absolutely adore your stamping style. Love your blog and the layouts - such an inspiration! Oh how I'd LOVE one! Thanks so much for this giveaway Natasha - your card is AWESOME! this is a beautiful card, I am loving simple designs these days. What a wonderful quick card this set makes! You are so kind to offer to give one away! Please put my name in the pot and I'll cross my fingers!! Fabulous card, love it! Thanks for a chance to win! What a beautiful card, Natasha! I love your cards and your Fall-To Layouts. And how fun to have a chance to win the PTI Anniversary set! Thanks for sharing your talents with the rest of us. I love the colors you used. Great 10 minute card, I love ideas I can use at those times when I need them, and this looks nice. Fantastic color combo! Love the clean graphics with big impact. Great stamps set. Thanks for sharing! How nice of you to do this giveaway! That is so sweet! I hadn't ever seen that set, and it is amazing for the sentiments alone...then add in the images! Thanks for the chance to win! And your card is very pretty! I love the popped flowers for some dimension! Another great card - love the stamp set - let's hope I win it! I simply love your blog and the cards/sketches you share. Keep up the great work! Beautiful card! very CAS :) Thanks for the chance to win, I don't have any PTI sets but would love some. PTI anniversary set! WOW! So cute! What a great card! Popping up the flowers give so much Ka-Pow factor. Good grief, what a fab card! Thanks for the chance at this candy too! I love your card. It's so simple yet it has such impact. Thanks for the chance to win this fabulous set. Ooo, so pretty - love the colors! Quick card, but big impact! I love the clean look. The fact that you could do a whole set in under an hour is fantastic. Thanks for the chance to win the darling PTI Anniversary set! Beautiful card, very CAS...LOVE it!!! Thanks for the chance to win the set! Very cute card. Very cute set, too! Thanks for your CAS inspiration. I look forward to your sketches every week! Your blog is the only stamping-related one I've kept in my Google Reader because of the beautiful cards you make. Thanks! What an adorable little card and stamp set!! I would love a chance to win it! Thanks so much!! Very cute! I didn't even remember seeing this stamp in the preview for the anniversary set, but now I'm thinking I'll need to get it one way or another! Thanks for the chance to win the set! oooh so generous! What a fab card! What a cute and simple card...I love it...and I love the stamp set! Love this card and the set. I have come to find my style through your blog. Love Clean and Simple! Sweet and lovely cards, as always! I love this round set too! Thanks, Happy Day! Clean and Simple blog + PTI stamps = perfection! Can't remember how I found your blog but it has become my "go-to" place ever since and I have recommended it to many of my stamping buddies. I always find inspiration here. Thanks for sharing your extra PTI anniversary set! What a lovely card!! Thanks for the chance to win that set!! Cute, clean card! Thanks for the opportunity to win your spare set - so generous of you! Love your Clean and Simple style. Thanks for a chance to win this set. Can't get my password to work so will have to leave this as anonymous, but I'm not! I was one short of getting this set. I hadn't seen the entire set before, it's adorable. Thank you for the chance to win this. I love your card...and your blog. Thanks so much for the chance to win! Love this site! Thanks for the chance! Wow, thanks for the chance to win. Love your card. WoW! I am #106 leaving a comment. You have a lot of people following your blog. I love your blog and the chance to win! Oh gosh, what a cute set! TFS! I absolutely love your cards & sketches & PTI stamps. i love your simple card. that anniversary set is very cool! all those sentiments, i love the mix. What a great stamp set! I'd love to win it! Thanks for the awesome blog site btw!!! What a brilliant card, I really enjoy the inspiration this site gives me that less really is best. Great card! This set is amazing! Thanks for the chance! A very sweet little card....and the stamp set is full of useful phrases. Thanks for sharing! What a great set! And how generous of you to share! Thanks! Another great 10min card. I always look forward to my updates as you always have such wonderful inspirational ideas. Simply awesome card! Thanks for the opportunity to win the set! Cute, cute, cute!! I love cute/simple cards. With 5 kids I need to keep it simple to get any stamping done! Such a simple yet pretty card. Thanks for the chance to win. Wow, what a nice giveaway! Love what you did with the set---you can't go wrong with these nice colors! Love your latest clean and simple card! Goodness gracious -- I certainly wouldn't have earned it -- but I certainly would use this gorgeous new set if I win it! Thanks for the chance. Wow, that's a perfect set for CAS stamping! I love your card. Love this set, too ... missed earning it this year ... sooooo close, lolol! I have just recently found your blog and love it to bits! I love this card! It is so clean and versatile. I may see this sketch coming out of my craft room soon. I'm totally loving this set! Thanks for providing the opportunity to win it! Very cute design! I'd love the chance 2 win this set! Thanks! I love clean and simple card, and especially Papertrey product. Thanks for the chance to win ! I love the simplicity here. It is very effective!! Lovely so simple and cute love it. I looked at what else it comes in the set, how sweet covers a lot of sayings needed. Thanks for the chance to win. Love being a part of your weekly challenge. What a delightful simple yet elegant card. I check your blog every day for new inspirational happiness! Would love to win this set. Thanks for the opportunity. Love the simple 10 minute card. THANKS for the chance to win the set too! Great card - love the simplicity of your designs! Love the popped-up flowers. What a cute, clean and simple card! This set just lends itself to so many quick and cute cards. Thanks for sharing and giving us a chance to win it! Fabulous card! Thanks for the chance! This is a beautiful card! I just ordered my first pack of kraft cs, and would love to CASE it by winning the PTI anniversary set. Thanks for the opportunity. Wow, what a versatile set! I could see this being used for lots and lots of cards...love the example you made! Thanks for the chance to win! I truly love the clean and simple inspiration I find on this blog!! Thanks for the chance to win this set. It is adorable!! Oh my word!!! I love the C&S card!! For some reason, I just got this post and even though I am subscribed...I did not get the past 4 posts...at any rate...I am a HUGE fan of PTI...Love all of the goodies and cannot wait for the new releases! LOVED your clean and simple card. Those little flowers up on pop dots are so cute. Very cute, yet simple card! I would love to be entered in your drawing for soem free goodies- thanks for the chance! Fabulous card as always Natasha! I LOVE the simplicity of this card. Thank you for giving us a chance to win a great givaway! Love the Kraft base and the Pop of white...Great card! This is a wonderful set I love your card. This card is so simple and so cute! Love it! i love your simple & quick card...I have not been buying PTI since the shipping went up so I would love to win this...thanks for the chance to win!! Great card! Thanks for the chance to win!! What an adorable set! Thank you for sharing and for the chance to win! I love this set! Thanks for the chance! I love your blog and your great sketches. Thanks for a chance to win this wonderful stamp set. Hi, I have recently discovered this site and I love it. It is wonderful to find designs that are simple and fresh, just the way I like to make them. I love this card and look forward to seeing lots more in the future. This site is one of my regular inspiration locations. I love your cards, including this one. I just made my first PTI purchase this year so it's great to have this chance to win this set - very generous. Thanks! Adorbale card-and how sweet you are to offer the opportunity! Thank you! I cannot believe you've got this set to give away. How nice of you!!! And I really really hope it's mine!! Love the card -- and thanks for the chance to win this stamp set! Love the card! Would love the set! This is TOTALLY ADORABLE!! Love the layout, and the stamps are perfect for it! Thanks for the chance! Another great clean & simple card, love it. That stamp set is too cute, thanks for the chance to win. I just love your card! So simple and striking! Ohhh, what a great set! I'd love to add it to my collection. Darling card! I'll be keeping my fingers crossed for your drawing. Thanks for a chance! Gorgeous card! I so envy your clean & simple style... I never know when to quit on a card - I couldn't do c&s to save my life - lol! Keeping my fingers crossed! Love this set. My goodness I can't tell you how much I love your blog. I'm very sad that I don't own any PTI stamps because it costs waaaay too much for me to ship to Canada. Thanks for a chance to win a super cute set! Thanks for the opportunity to win! Love the fresh look of this card! I would do anything for a Papertrey set! It is very very generous of you to share this with your readers! Thank you so much! And thanks for inspiring to create such simple and wonderful cards! I LOVE this - a really clean and simple design. THe stamps remind me of the pop art that was done more than 30 years ago. I hope I win them!!! Simple and sweet! Love it. Thanks for the opportunity to win a PTI set. Very generous of you, tfs! I especially love your 10-min cards and the colours are just perfect in this one. Thanks so much for the chance to win this lovely set! Love it! And love the set. I love this set and have only just discovered Papertrey - my first order arrived today. The card is so sweet too. Love this CAS card! Just found this blog recently and have been enjoying the sketches. Cool give-a-way! This is a great card. I love the kraft base. It sets of those flowers in a perfect way. Love it. I love your cards and visit your site daily for inspiration. This quick card is a good one for my 'go to' folder, for those times I need something in just a few minutes. Thanks for sharing. What a cute set! Thanks for all the awesome inspiration! I love that in the world of more is better, you've kept a clean style that really highlights the message and design. There's a time for all designs but I am drawn to yours. Thanks for the chance to win the PTI set. I found them late in the last year. I would just love to own this set. It would give me an excuse to buy the matching die. And your card is simply sweet. Those colors look great against the kraft base.